The electronic time & date stamps we offer from SEIKO Solutions Inc., Japan are the most reliable and advanced devices of their class. SEIKO has decades of experience with high precision and reliable time & date stamps and other time recording devices. Between them, these time & date stamps offers more convenient and versatile features than ever with various print formats and numbering, and a large window for positioning the document or material to be printed. They can be applied to every business situation you want to record time, date and/or numbering or replace old and heavy manually operated time & date stamps, providing verification and adding a level of accountability that cannot be duplicated by hand-written or rubber stamping methods. As such they are ideal for companies wishing to record a printable time stamp on their own company documentation. The variety of programmable print formats enables them to be used by many work environments - garages who wish to stamp service logs, educational institutions that require coursework proof of submission, pharmacies wishing to date stamp goods delivery, pathology / histology / haematology / microbiology labs time & date stamping samples, to name a few. 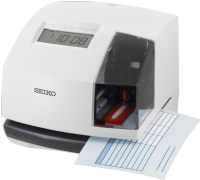 The SEIKO TP-6 is a low cost, but high quality, time & date stamp which will cover most situations where time & date stamping of documents is required. 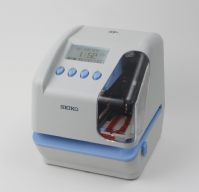 The SEIKO TP-50 has more advanced features such as two-line printing in one pass, customised comments, multiple print set configuration, shifted time printing, counter mode, and more (some features require USB configuration).